Red Dead Online will receive a large update February 26th, gaining new Free Roam Events, Showdown modes, Races, and more! Currently, Red Dead Online is still in beta, so expect the patch to improve balance, performance and bugs etc. Rockstar also promises new Weapons, Clothing, and Emotes, as well as weekly content and promotions to watch out for. 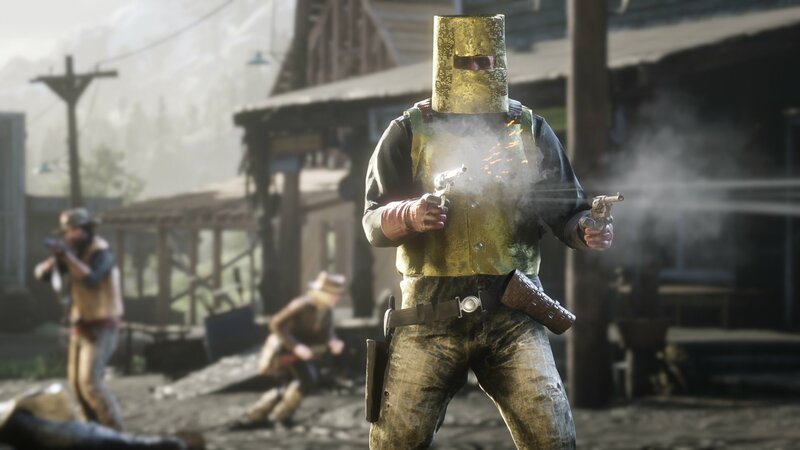 The Fool’s Gold Free Roam Event sees players competing over a suit of Golden Armor, The goal is to kill the armor wearer for points and the ability to wear it yourself. The armor wearer also gains points for kills while suited in the shiny shell. Added to the Competitive Challenges, Fishing Challenges are sorted by type. Players will automatically receive the required rods/lures/bait once they’ve accepted the challenge (crickets for river, crayfish for swamp etc). You are also safe from being shot by other online players while in the midst of the challenge. Wins are decided by “highest weight total of fish”. More details to come on the new modes: Up in Smoke, Spoils of War, and Plunder. These modes will see players and teams competing to “capture and deliver bags, steal loot from each other and survive”. The race modes are getting Target Races, in which players bullseye targets while riding a horse and pass checkpoints to the finish. A “high grade, high capacity Evans Repeater Rifle” from B.D. and Co, as well as the Rare Shotgun from D.D. Packenbush. Pick up both from the Wheeler &Rawson Catalogue or your local gunsmith. New clothing includes: Diamondback Hat with snake decoration, a Rutledge Vest with fur trim, as well as more “Outfits, Jackets, Boots, Coats, Gloves, Hats, Vests and more”. Not much info was given about the emotes other than including “everything from greets, to reactions and taunts”. Ps4 users will have the earliest access to Open Target Races, competing in an open area for the highest mount of targets taken down while on horseback. PS4 players also get to try out the Jawbone Knife first, along with new many new clothing items and three new emotes. In the hype towards the launch, players will earn 20% bonus XP in Red Dead Online Beta throughout this week before the new content lands. We stream episodes of Red Dead Redemption 2 on our youtube channel. Our latest episode focuses on getting back into the mainline story after taking a long break.